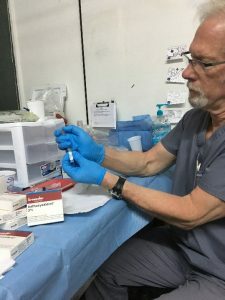 The annual humanitarian medical trip to Honduras organized by the Hackett Hemwall Patterson Foundation was once again supported by Kreussler Pharma with a generous donation of several hundred packs of Aethoxysklerol®. Most Honduran patients with severe varicose veins or ulcers cannot afford treatment for their disease. This annual trip, during which several doctors from industrialized countries treat patients for free, is therefore both very welcome and much needed. The treatment provided is mainly in the form of foam sclerotherapy as it has many advantages over other methods of treatment. During this particular trip, Kreussler Pharma, the manufacturer of the world’s No 1 sclerosing agent, made it possible for all Honduran varicose vein patients to receive treatment. WIESBADEN, 2018 – This March, as in the past several years, Kreussler Pharma once again agreed to support a charitable medical trip to Honduras. More than half of the population still lives in poverty and is underserved by vein specialists. These people are therefore in need of medical care that they are otherwise unable to afford. The Hackett Hemwall Patterson Foundation (HHPF) has organized a humanitarian medical mission to Honduras every year since 1969. With the help of donations from the industry, a group of volunteers at their own expense and in their own free time provides free high-quality treatment to patients with complicated varicose vein disease. 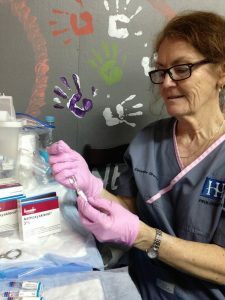 For one week, they set up temporary phlebology clinics at several different cities in the north of Honduras. The sponsorship of these annual trips means not only that patients are provided with free clinical care but also that local physicians enjoy one full day of lectures from experts on venous disease followed by a practical training in sclerotherapy. This ensures, that knowledge is transferred to local physicians and will have a lasting impact for the people of Honduras. This year it was possible to treat more than 3,000 patients with advanced varicose veins, so that the amount of treated patients could be doubled in comparison to 2005. These patients gratefully accepted the free treatment after decades of coping with complications from their varicose veins, such as open ulcers, pain and severe skin alterations. 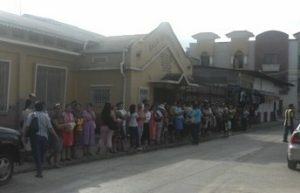 People from rural Honduras travelled several hours, sometimes even days, to reach one of the clinics. Patients often line up several hours before the clinics open each day, demonstrating that the need is great. Treatment with ultrasound guided foam sclerotherapy was the treatment of first choice. Foam sclerotherapy has many advantages, including safety, effectiveness, portability and cost effectiveness – a factor which is particularly important in a third world setting. This annual Honduras Sclerotherapy Trip is only possible thanks to the combined efforts of all of those who are involved – the HHPF, which organizes and sponsors these trips; the doctors and other volunteers, who donate their time and experience; and companies such as Kreussler Pharma, that provide the necessary amount of the sclerosing agent Aethoxysklerol® to treat all the patients.